We've all heard, or maybe experienced, tales of brilliant business ideas being born on a conference room whiteboard or cocktail napkin. Zamurai is an app designed to allow your iPad to replace the whiteboard, napkin, or piece of paper as a medium for idea creation. 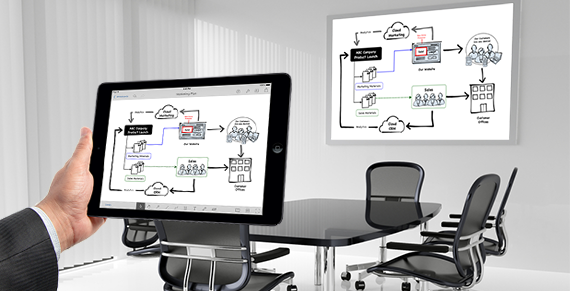 Zamurai's "whiteboards" give you a wide range of options for drawing and diagraming ideas and processes. You could think of them as simpler versions of diagrams created in programs like Microsoft Visio. Like Visio, Zamurai gives you access to a library of icons for laying out everything from sales workflow plans to network diagrams to website wireframes. And, unlike a physical whiteboard, it gives you the ability to save and share the diagram--so there's no need to take a picture of the board. Plus, it's an easy way to impress customers and coworks alike with a neatly designed diagram instead of one scribbled out on a piece of paper. The Zamurai app is available for iPad only in the iOS app store. The app itself is free, but features like sharing and customized image libraries do cost extra ($2.99 per feature, or $6.99 for a bunde of four).